"EU must stop allowing exploitation of Western Sahara"
"It is a violation of international law for the natural resources of Western Sahara to be exploited in this way. But the EU continues to buy permits from Morocco for EU fishing vessels which allows them to fish in Western Saharan waters. The people of Western Sahara have never given their permission for this to happen", stated MEP Jill Evans in a press release. The European Union must stop allowing the exploitation of Western Sahara's natural resources. That was the conclusion of a hearing held at the European Parliament in Brussels this week and hosted by Plaid Cymru MEP Jill Evans. Fishing in Western Sahara's waters without the consent of the Saharawi people is illegal. Ms Evans is part of the campaign to stop the EU buying fishing permits for EU boats to fish in Western Saharan waters. The hearing was told of human rights abuses by the Moroccan regime in Western Sahara and the Swedish government's recognition of Western Sahara as an occupied territory whose natural resources Morocco has no right to exploit. Western Sahara was occupied in 1975 by Morocco which now controls the country's resources and refuses to recognise the Saharawi people's right to self-determination. 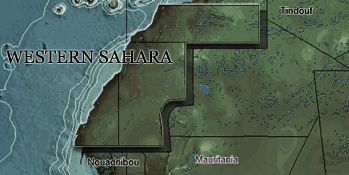 No state in the world recognises Moroccan claims to Western Sahara. The UN has condemned the occupation. The hearing at the European Parliament in Brussels heard from speakers John Gurr from Western Sahara Resource Watch, Asa Westlund MEP (Sweden) and Elamahjoub Maliha, a human rights activist from Western Sahara, as well as Jill Evans MEP. "The European Commission's behaviour in respect of Western Sahara's natural resources is completely unethical. "It is a violation of international law for the natural resources of Western Sahara to be exploited in this way. But the EU continues to buy permits from Morocco for EU fishing vessels which allows them to fish in Western Saharan waters. The people of Western Sahara have never given their permission for this to happen. "Morocco continues to refuse to co-operate with the decolonisation of Western Sahara and allow the Saharawi people the right to decide their own future. "By signing these fishing agreements the EU is ignoring the illegal occupation of another country. We are working to get the existing EU - Morocco fisheries agreement suspended, and when the current agreement is up for renewal in 2011, the EU must remember that human rights are more important than trade deals." Picture available - Speakers at the hearing (L to R): John Gurr - Western Sahara Resource Watch, Jill Evans MEP, Asa Westlund MEP - Sweden, Elamahjoub Maliha - Human Rights Activist.